The knee is a synovial joint, which means it is lined by synovium. The synovium produces fluid which lubricates and nourishes the articular cartilage. Articular cartilage is the smooth covering at the ends of the femur and tibia. It is the damage to this surface which causes arthritis. The two femoral condyles make up for the rounded end of the femur. Its smooth articular surface allows the femur to move easily over the tibia (shinbone) . The tibia (shinbone), the second largest bone in the body, is the weight bearing bone of the lower-leg. The menisci incompletely cover the superior surface of the tibia where it articulates with the femur. The menisci act as shock absorbers, protecting the articular surfaces of the tibia and femur. The fibula, although not a weight bearing bone, provides attachment for the Lateral collateral ligaments (LCL) and the biceps femoris tendon. The patella (kneecap), is attached to the quadriceps tendon above and the patellar ligament below. It rests against the anterior (front) articular surface of the lower end of the femur. The patella acts as a fulcrum for the quadriceps by holding the quadriceps tendon off the lower end of the femur, thereby increasing the strength of the quadriceps. The medial and the lateral meniscus are thin C-shaped layers of fibrocartilage, incompletely covering the surface of the tibia where it articulates with the femur. The majority of the meniscus has no blood supply and for that reason, when damaged, the meniscus is unable to undergo the normal healing process that occurs in the rest of the body. The menisci act as shock absorbers, protecting the articular surfaces of the tibia and femur. As secondary stabilizers, the intact menisci interact with the stabilizing function of the ligaments. The anterior cruciate ligament (ACL) is the major stabilizing ligament of the knee. 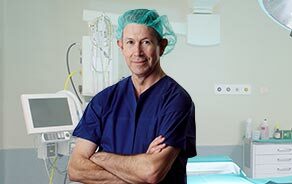 The ACL is located in the center of the knee joint and runs from the femur (thigh bone) to the tibia (shin bone), through the center of the knee. The ACL prevents the femur from sliding backwards on the tibia (or the tibia sliding forwards on the femur). Together with the posterior cruciate ligament (PCL), the ACL stabilizes the knee in a rotational fashion. Thus, if one of these ligaments is significantly damaged, the knee will be unstable when planting the foot of the injured extremity and pivoting, causing the knee to buckle and give way. Collateral Ligaments prevent abnormal sideways movements. 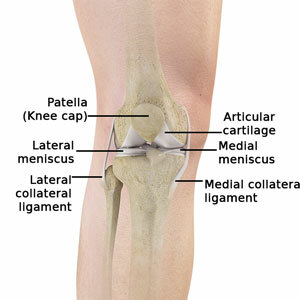 Superficial MCL (Medial Collateral Ligament) connects the medial epicondyle of the femur to the medial condyle of the tibia and resists the lower leg bending outwards. LCL (Lateral Collateral Ligament) entirely separate from the articular capsule, connects the lateral epicondyle of the femur to the head of the fibula and resists the lower leg bending inwards.